At last we come to the final entry on the list. The game that we liked above all of the others. We aren’t arguing that this is the best game ever - just the one we personally have had the best experience with. Time Stories is by far the game we look forward to playing the most. It incorporates a lot of the bits and pieces of the games we’ve mentioned recently. Immersive storytelling, some randomness with dice rolls, and puzzles to figure out. Time Stories is a scenario game which generally means you are only going to get to play each scenario one time unless you have a bad memory. Some of them are better than others (my personal favorite is still Marcy’s Case) but they are all very unique and bring some small changes to the mechanics to make the game play feel fresh each time. While you can only play each scenario once we’ve also really enjoyed watching other people play the same scenario as us to see how they play through all the events in the story differently! Another one of the aspects that really brings us into the game is the theme of the game is a time traveling mechanic. You are all time agents from the future going into the past to fix something that has gone wrong in the timeline. Very few board games successfully integrate time travel into the game. Each of the scenarios has a brief bit of story in the present day (the future to us) that interconnect from scenario to scenario. While each scenario has had its own pay off we are looking forward to where the story about the overarching world takes us as well! The game play mechanics are fairly simple with the group going from location to location taking time to spend actions with a limited amount of time allowed. Occasionally there will be tests or combat that need to be resolved which are performed with simple dice mechanics. This gives Time Stories just enough meet to be more than simply a story telling games like the others that we have mentioned. You have limited time so a lot of the game is figuring out how to get from the start of your adventure to the end with time to spare! If you don’t succeed on your first try you get to keep a few things and try again! This also gives you a handy time to take a break if you want to spread a scenario across a few evenings of fun! No game is for everyone but this one was definitely made for us. A terrific theme, immersive story, cooperative, and lots of exploration with puzzle solving weaved in as well. We always wait with baited breath for when the next expansion will be released. There have been some exploring the arctic, the original is in an insane asylum, some deal with grisly more modern events. Each one has felt distinctly different while still giving the same enjoyable gaming experience. We wish we could just have that same fun experience each time but maybe the fact we can’t replay them makes us like it that much more as we are thinking about Time Stories as we eagerly await the next release. So with that we conclude our Top 100 games with our personal favorite - Time Stories! We return to the worlds of Lovecraft for our second best game of all time, Mansions of Madness. The first edition of this game was great and was always bundles of fun. It had some drawbacks though with the requirement for one person to play a dungeon master role as well as the set up being a bit of a bear. Not only was set up difficult if it was done wrong it could throw the entire scenario out of whack! Even with all of the issues the first edition had it still would have made it on the Top 100 because it was one of the most immersive story games that we had. Sometimes I do miss being the dungeon master role because it was great watching people unfold my evil plans! However, recently Fantasy Flight games released a second edition which helped this game reached almost to the top of our Top 100! The new edition made the game fully cooperative by having the evils of the scenario operated by an app for either your smartphone, tablet, or computer. So now there is no way for the set up to be wrong and everyone gets to join in the fun of figuring out the mystery or being driven insane by the scenario. The app provides lots of flavor text and background music to draw the players deeper into the occult dealings. While the app simplified some of the aspects of the game they didn’t get rid of some of the best parts from the original game. There are still little puzzles that need solving (although now they are in the app) and you still roll the dice to see if succeed in the task. Although not knowing how many you need adds to the mystery and the tension of the game. Being in the Lovecraft universe this game is probably not for those players who are relatively young but for those of us who are advanced in years and love cooperation, exploration, and mystery in the their games owe it to themselves to give Mansions of Madness 2nd edition a try. While investigating some shenanigans in the town of Arkham is a blast from our previous entry not tickles the investigative itch like helping out Sherlock Holmes. So the next game on our list in the #3 spot is Sherlock Holmes Consulting Detective. 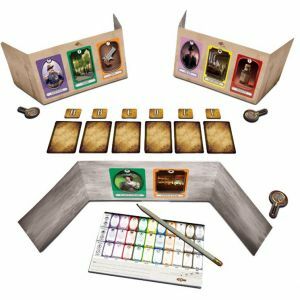 The players work with various characters in the world of Sherlock Holmes trying to solve a case with the same speed and logic as Holmes himself! Similar to Mythos Tales this game brings with it a map, newspaper, directory, and a scenario book! After an engrossing opening narrative the players are lot loose to explore the city of London and all of it locations in order to unravel the mystery of the case. You can go to the crime scene, the police, the coroner, and many other locations! We enjoy checking the libraries because who knows what great information we could find there! Consulting Detective is better for quite a few ways and it also came first being quite an old game that has been getting recent reprintings. The game has fewer typos than some of its comparable games and as far more content if you find you enjoy the game. We have a hard time repeating games so we haven’t even made it through all of the cases and expansions yet! Some of the expansions bring a longer story into the mix. The first expansion includes some cases related to Jack the Ripper and lets you follow the cases from one to another in a long campaign of cases. Then the next expansion added a large mansion to the game which adds even more locations to explore and logic possibilities to solve the case. Hopefully there will be cases brought to us in the future that add even more excitement before we finally play all of the cases. We always have a ton of fun playing Consulting Detective. Admittedly the game doesn’t have a ton of mechanics to the game and it is more of the experience that we are enjoying. Cooperative immersive games are obviously important to us and our gaming experiences. If you want to spend an evening going to 221b Baker Street and using your noggins to solve a case - make sure to give Sherlock Holmes Consulting Detective, our #3 of all time a try! For our fourth favorite game of all time we are delving back into the world of Lovecraft for a story based game, Mythos Tales. As you work your way through the game book you will find bits and pieces of mystery and signs of the occult. There are not a lot of game play mechanics but we don’t always need a deep and complex game to entertain. With a great story and immersive theme games like this can really tickle our fancy. Mythos Tales starts out with an introduction to the mystery you are attempting to solve. Something otherworldly is likely occurring and you must explore the area to find the culprit and hopefully stop the world from by torn asunder by madness. After the introduction what the group does is largely up to them. 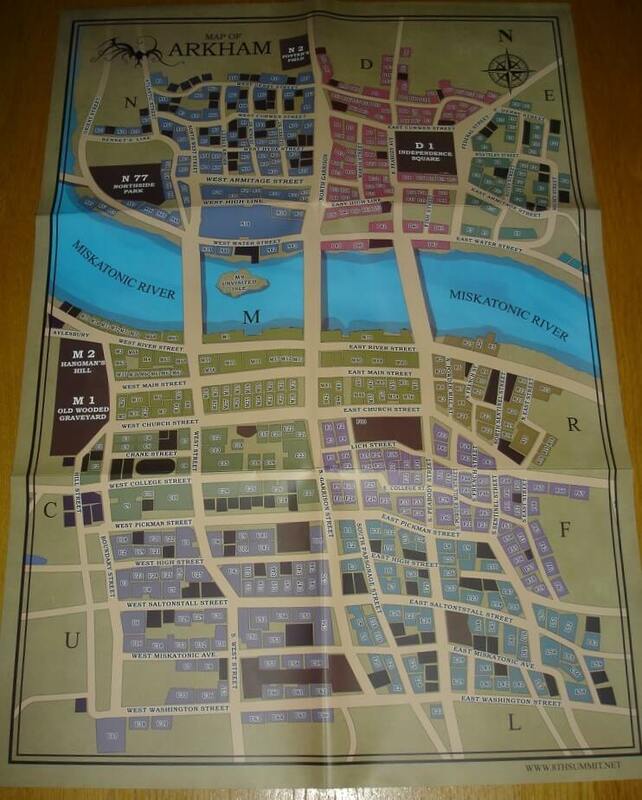 The group will select a location which has reference in the scenario book to read to continue the adventure. Trying to decide where you want to go can sometimes be confusing so the game also comes with information that you can use to guide yourself outside of the scenario book. Each case also comes with a newspaper that will likely have some important information. Although it will be mixed in with the general news of the day. If you are looking for specific individuals you can also looking the Arkham directory to find where businesses or houses of suspects might be so you can go investigate. Lastly the game also includes a map of Arkham, Massachusetts with tags for to look up those locations in the scenario book. It seems the best course of action would be to not live in a town constantly bothering by cultists and great evils. But as brave investigators we will risk our life and sanity to unravel evil plots before they can come to pass and destroy the world. While there are now choose your own adventure games that are branded with that name Mythos tales outpaces those with a deep theme and a more serious tone. In the end though that is the kind of game you are signing up to play with your friends (or solo). Going from location to location your group of friends will attempt to solve the case laid in front of you. When you think you have gathered enough information you can answer the questions at the end of the scenario and then the ending narrative. Getting a high score is never the end goal for us, Mythos Tales is all about the journey. A journey that was fun enough to land it as #4 on our Top 100! Top 100: #5 Time's Up! Now it's time for our last party game of the Top 100 - not saying the rest of the list is super serious but Time’s Up always gets a laugh out of us. The game is a mix of trivia, memorization, and charades. Don’t let the charades part scare you away. Learn how to play a game and we hope we can change your mind! The game starts with everyone getting a small pile of cards that they will remove some of them from the game and keep the others. Its important to try to remember what was on your cards because they are some of the answers in the deck. The group splits into two teams trying to get the most points. The first run through the deck the clue giver can say almost anything and their teammates can make unlimited guesses. The problem is you aren’t allowed to pass so you have to work rather hard sometimes to lead people to the answer. Then the game mixes up the formula for the second round when the clue giver can only give one word clues and their teammates only get one guess. You are allowed to pass this time though! So it is important to remember the cards because round two is played with the exact same answers you’ve seen before. Just like round ones the teams trade back and forth through the deck until it is depleted. After you finish the second round it is time for the exciting third round which admittedly is a lot like charades. The clue givers can only act things out and can’t use words. This is when it is the most important time to remember the cards in the deck. Now that you have heard every card at last two times it can really help with the charades. Imagine playing charades when the answer is in a small sample set - it makes it a lot less stressful! Every time we play there are always fun inside jokes that get made that work their way into the charades. If there was a card in round one that the clue giver used a cat to lead them to the answer when it is round three someone might act like a cat even if it completely irrelevant to the name on the card. Just hoping their team makes the connection! We always have a blast when we are playing Time’s Up! If you want to have a ton of fun with friends in family make sure to pick up the game, or a small expansion those work too! Not just any party game could make it to the #5 spot on the Top 100! Our favorite quick playing game is the next entry on the Top 100. Werewords (or perhaps Insider) both only take around 5 minutes to play each round and each time we play we always have a blast. Essentially the game is 20 questions at its core - which admittedly probably isn’t a great sales pitch. The designers added enough extra bits and bobs to the core game to make it super exciting. Instead of only one person knowing the answer in Werewords there are multiple people who know the answer. Some of them will be helping you (The Seer) but others will be trying to lead you away from finding the answer (The Werewolf). These roles are shuffled up each round so you never know who is being helpful or not unless they are being very obvious. There is even a chance that the mayor could be the werewolf which makes things pretty crazy! The goal of all of the non-werewolves is simply to get to the selected word. As you ask questions you will get a chip that says yes or no so people can keep track of both how many questions you asked and what responses you got. If you fail to find the word then there is one last chance of victory in finding the werewolf! So they can’t be too actively misleading. For the werewolf their goal is to keep the rest of the group from getting to the answer within the time limit. I sometimes have a hard time being the werewolf because i forget i’m supposed to be throwing people off the scent! If the werewolf fails in their goal and the group gets the word they also have another chance to win by finding the Seer! So both groups have an ability to win despite failing their primary objective. The game is not complicated and is more fun than the sum of the parts in the rule book. Because of the fact the werewolf and the seer can’t be obvious it is always a push and tug to help or mislead the group without being too obvious. Which makes it hard for the villagers to also know who is who and which leads to follow! There are even more roles to include once you really get into the game. Because of its quick play and being tons of fun we will always be up for playing a game. Just find us with a few spare minutes at Platypus-Con and we might jump in for a round of our #6 game on the Top 100, Werewords! Next on the Top 100 is pure exploration in a box! It goes by the name of 7th Continent. You begin the game afflicted with one of the curses included in the game and marooned on a mysterious continent. With only your wits and possibly your companions will you be able to survive long enough to get rid of the curse you carry with you. 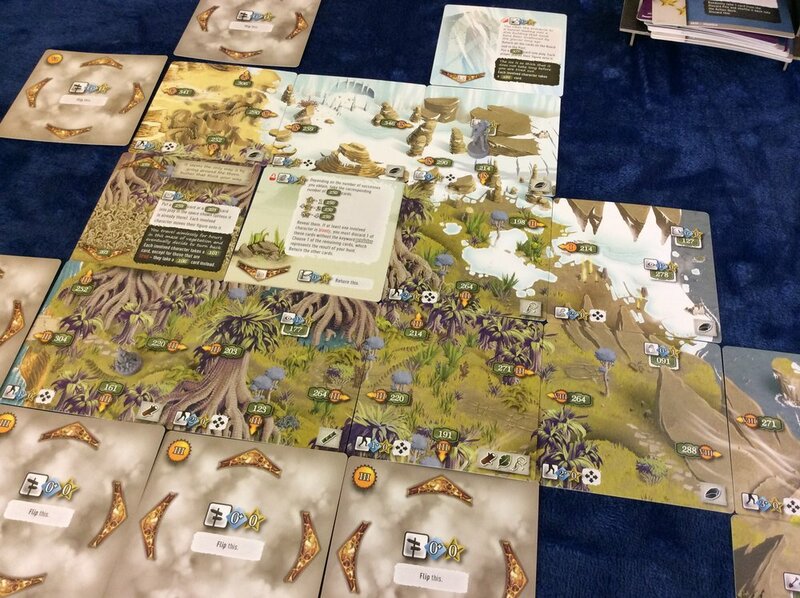 7th continent is a vast game that once you understand the system can likely take hours upon hours to win or die. It comes with a great save system that you can do any time you choose to sleep in the game. You can also choose to just keep on playing when you camp in the game because it is very necessary in order to win. We learned that the hard way. As mentioned the game is pure exploration - you won’t know what is awaiting you around the next corner. Will it help you or hurt you in your adventures. Also depending on certain factors placing might change if you visit them again. Or if you trigger some mechanism you might also permanently (at least for your current play through) alter your map. The curse you are afflicted with can also occasionally change the circumstances of your adventure making playing different curses all a little bit different. The game is played almost entirely with cards. The map is made out of numbered cards so you know which ones to place in certain locations to build out your map. Your action deck is both your stamina pool as well as how to judge if you are successful when you take certain actions. For example going hunting might require you to turn over 4 cards and depending on how many stars you get out of those cards is how successful you were. However, if you have a weapon you might get bonus stars before you even start flipping cards making it more likely you will get the meat you need to survive! Admittedly, despite playing this game quite a bit. We’ve never managed to beat the very first curse. We have gotten close though - it is challenging both to find all the objectives you need and to not die of exhaustion before then! That does not hold back our enjoyment of the game. If there was ever a board game where the journey was the point and not the end game this would be the one. It seems every time we crack open this box we are off on another adventure into the great world of the 7th Continent! Following right after Hanabi is a game that uses the same mechanic but in different ways. Instead of being cooperative though 13 Clues is a competitive game in which you are trying to solve your own case before others solve theirs. You will have to use the knowledge you can see and pointed questions in order to acquire knowledge. As we mentioned 13 clues uses a very similar card mechanic that Hanabi uses where you can see everyone else’s answer as it is placed in front of them facing away from them. So the answer to your case is directly in front of you and everyone else can see your answer. Everyone also has some private information behind their screen so they all know a little bit extra. On your turn you can do one of three actions. You can ask a player of your choice a question to get more information. The types of questions available are fairly restricted, essentially asking them how many of a certain card they can see. It would seem that they would directly give you an answer of what is in front of you but because of that secret information behind their screen they could be talking about those instead of the ones in front of you. At certain player counts there are cards in the middle of the table. Instead of asking a question of another player you can spend one of your magnifying glasses to look at one of the cards in the middle to remove it from contention for your case. Lastly, you can attempt to solve your case - you get to keep playing if you are wrong which is super important to us in a deduction game. But it does cost you your turn so you won’t be gaining any information that round. If you were right though then you win the game! So our love of deduction games continues into the Top 100 with 13 clues. And as preview we can promise this isn’t the last one on the list. Evidently deduction is one of the ways we love using our brains while we are playing board games. 13 clues is simple mechanically and uses some great logic to figure out which cards are in front of you. If you want to test your powers of deduction and logic make sure to give 13 Clues - our #8 - a try! Some games while simple can be really great and exciting at the same time. That is the slot that we put Hanabi in - our #9. Some games have now used its central unique mechanic in different ways but Hanabi was the first time we experienced it. You are working together with your fellow players to put on the best fireworks show. But pulling off that show can be difficult when it is hard to communicate! The central difference Hanabi has to lots of other card games is that all of your cards face away from you. So you have no knowledge of what cards you have unless told by other players. But you do know what all of their cards are which occasionally can help you deduce some knowledge about what could possibly be in your hand. On your turn you can either give a clue, play a card, or discard a card. Simple choices which is another thing we like in games. Which you decide to take is sometimes a hard choice since the number of clues you have as a group is limited. 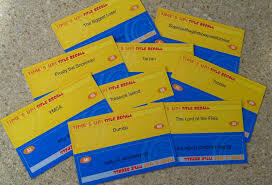 The only way to get clues back is to successfully play a five or discard a card. But be careful which card you discard as they are limited as well! As a group you are trying to get the 1 through 5 played of each of the five colors. But how do you do that without knowing what is your hand? As mentioned the only way you get information is through clues you get. But not only are you stuck in that restriction but the types of clues you can receive are limited too. When giving a clue you can only talk about a single color or number and you have to call out all the ones that match even if you might only want to point out one card! It is good to think that the only reason people are telling you information is because they want you to do something with those cards. There is no room for extraneous information! Hanabi is a great game unmodified as you try to puzzle out what each of the cards in your hand is and how best to use them - either as cards to play or to discard to retrieve clues. Players aren’t supposed to communicate in any way other than those clues but sometimes the unintentional cheating creates some of the best moments. As you reach to discard a really important card and the rest of the group tries not to wince. It is the terrific game play and the fun memories we’ve had playing it that earn it the high spot of our 9th favorite game of all time! We have arrived to the Top 10, the length of list most people would generally make for their favorite games. It is definitely been great to have the ability to play tons of great games. The first game in the Top 10 is Imperial Assault, a game closely related to a game we recently talked about - Descent. When you upgrade my favorite dungeon crawler with a few mechanic tweaks and a Star Wars theme I knew I was going to be a fan before it even got released! Some of the updates to the original system they made were to alter the order of play and add some more features to the dice. In Descent all of the heroes take their turn and then all of the bad guys take their steps. This can be very overpowering very quickly and not give players too much of an opportunity to react. Now in Imperial Assault it is more of a back and forth with one player activating and then one enemy group activating. Giving both parties more chances to react to the others movements. For the dice the ability to completely miss on an attack left the attack dice and is now on the defense dice, and only one of them at that. So if you are one of the special characters that rolls a white die for defense you have a chance to dodge an attack entirely. This also means that the attacker will never cause their own attack to fail (unless they are too far away). Fantasy Flight also added a surge blocker to the defense dice so there is a chance that the defender can take away the ability to use some damaging abilities that can be very painful! Lastly, the Star Wars them is really what made the game a strong appeal for us. While we do enjoy the fantasy setting of Terrinoth as well we have less connection to the setting and the world. With no firm idea of the world we are playing on the story is less consequential. Playing the Star Wars universe with tons of games, movies, and books to remember makes the campaign story much more deep to us. While you never get to play as the main characters sometimes they do make a cameo in your campaign! Imperial Assault is in the end just a better game mechanically than Descent, so with or without the theme change this game would have been higher on the list. There is also a skirmish mode that they put in Imperial Assault that a lot of people tend to really enjoy. We just haven’t given it a try ourselves as we love the campaign setting. It takes a while to learn all the mechanics and their intricacies but if you are a fan of Star Wars or sci-fi dungeon crawlers you owe it to yourself to give our #10, Imperial Assault, a play or two!